10 Years After Housing Crisis: A Realtor, A Renter, Starting Over, Staying Put In Phoenix, homes lost 56 percent of their value during the bust, plunging hundreds of thousands of homeowners underwater on their mortgages. The market may have rebounded, but many scars remain. In 2007, home prices started to tumble. Homeowners began to default, leading to record foreclosures. Lenders and banks were left holding bad debt. Major financial institutions began to fail, one by one: In January 2008, mortgage lender Countrywide was sold to Bank of America; Bear Stearns was bailed out in March and sold to JPMorgan Chase; in September, Lehman Brothers collapsed and Washington Mutual became the largest bank failure in U.S. history. In October, Congress passed a $700 billion bailout bill. Officially, the recession lasted only until June 2009. But wages tumbled and unemployment soared well past then. By February 2010, the U.S. economy had lost 8.8 million jobs from the peak in late 2007. 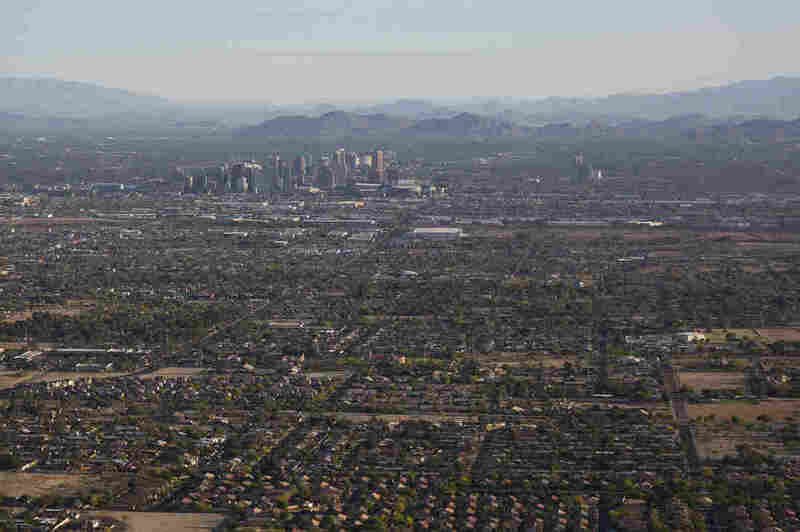 Phoenix felt the housing collapse worse than almost anywhere else. On average, homes in the metro area lost 56 percent of their value — the third worst in the country. The meltdown in prices left hundreds of thousands of homeowners underwater on their mortgages, owing more than their houses were worth. Some chose to stay in their homes. Some walked away by choice. Many were forced to leave. Foreclosures swept across the city by the tens of thousands. Ten years later, America has rebounded from the Great Recession and the housing crash. The stock market has recovered. Unemployment is lower than it was during the housing bubble. In Phoenix, the scars remain. "I've seen a lot over 27 years," Sean Hahn says. At 50, he has spent more than half his life working as a Realtor in Phoenix, since the early 1990s. There has been a lot to see in Phoenix real estate in that time. During the housing bubble, local housing prices doubled in just three years. "We'd put a house on the market, and by noon we'd have 12 offers," Hahn says. Clients Hahn had helped buy a house a year or two before began to call about exit strategies. He learned how to negotiate short sales, helping homeowners come to an agreement with their bank to sell the house for less than they still owed. Hahn is upbeat, naturally optimistic. The change haunted him. "I had a stomachache all the time when I was working through that process," he says. "They'd invested so much time and money in making it a home, and now they have to leave it. I still have nightmares to this day that I'm going through that." During the bust, Hahn would go out driving with investors, looking up foreclosed homes and evaluating their condition. Sometimes the departing owners would clean the place before leaving. More often, they did not. Hahn saw properties that had been stripped of cabinetry, doors, air conditioners, copper pipes, even the lightbulbs. The worst were the houses that had been intentionally defaced by their desperate, angry former owners. Out of them all, Hahn says there is one abandoned house he remembers most. In 2012, he and an investor were driving around town inspecting foreclosed homes. One house on their list, a small ranch about 20 miles north of downtown, reeked so strongly of urine that they could smell it from the driveway. The investor told Hahn, "Let's go; this looks horrible." But Hahn wanted to take a look: It was the first house he'd ever bought for himself. He and his wife purchased the house in the late '80s for $55,000 and moved out a few years later. Now, it was next to ruined. "It was so sad. It was just, like, destruction and damage where people just let go. They just lived in filth. They destroyed the house," he says. "My wife and I had so much pride in that little home." In October 1999, Adriana Rodriguez and her then-husband bought a comfortable house in a decent part of Phoenix for themselves and their two young daughters. She did administrative work in a dental office; he was a forklift operator for warehouses. In 2005, they refinanced their mortgage to make some upgrades to the house. But, she acknowledges now, "We didn't understand the loan quite completely." After a few years, their interest rate jumped, and their mortgage payments skyrocketed. About 80 percent of all subprime mortgages written during the peak of the housing bubble were what was known as "exploding" adjustable-rate mortgages. Lenders offered two or three years at an introductory teaser rate. Then, interest rates would jump as much as 4 percentage points, and the borrower's monthly payments would skyrocket. Rodriguez says she believes they were taken advantage of. Multiple analyses of home loans initiated during the housing boom have found that black and Latino borrowers were more likely to receive high-risk loans than whites with similar incomes and credit scores. And once they had the subprime loans, blacks and Hispanics were often charged higher interest rates than were white subprime borrowers with similar credit scores, according to a study by the Center for Responsible Lending, a nonprofit research group. Experts disagree on how much blame for the crisis should be placed on subprime lenders. Only about 5 percent of housing mortgage applications approved in 2006 were subprime. The racial disparities in lending practices helped drive foreclosure rates higher for borrowers of color. And mortgage discrimination persists today. As the Rodriguezes' mortgage payments ballooned, the economy collapsed. Her husband lost his job in 2008. They began to struggle to hold together their marriage. In the end, they divorced, leaving Adriana Rodriguez to pay for the house on her own. She sold her car to help with home payments, but she was only delaying the inevitable. In 2010, she defaulted on the payments, and she and her daughters moved out within a year. They've rented ever since. Now, at 42 years old, Rodriguez says the thought of buying a new house is daunting. "I just don't even want to go there," she says. "I have friends who have recovered from it and have purchased homes. But I don't know where to start. It's just hard. You don't ever want to go through that again." In 2006, Kristin and Justin Hege bought the house they thought would be their "forever home." At the time, she was 29 and he was 27. It felt perfect: the right size, the right location. They brought one of their sons home from the hospital to that house. "I grew up in a small town in Ohio," Kristin says. "The 'forever home' thing was a legit thing. You stayed in your house until your kids went away to school." Expecting to stay in the house for 15 years or more, they decided to do a complete remodel in 2007. They refinanced their original mortgage to pull out some equity to make the renovations. Afterward, at the height of the bubble, their house was valued at more than $400,000. When home prices began to fall, their initial reaction was to stick it out. They could have kept paying their mortgage. The Heges own their own businesses; they were very sensitive to the damage a foreclosure or a short sale could do to their credit. And they thought it felt wrong to walk away from a commitment they'd signed on to. "We could have each had two more jobs apiece and made it work and done it," Kristin says. "It was very hard for us and who we are as people to walk away." But as home prices kept falling, the financial reality became impossible to ignore. Events like short sales can stay on a credit report for seven years. Because of that, many Americans who missed payments, sold short or went into foreclosure during the recession are now returning to the housing market with healthy credit. They are called "boomerang buyers." After seven years of renting, the Heges bought again for the first time last year. "Anyone can make a mistake. We made a mistake. We made a dumb choice," Justin says. "We are much more fiscally responsible now. Seven years is a long time to learn." In 2007, Fred Decker was tired of his job managing a Starbucks. He was 32. He quit and became a locksmith. Soon, Decker was spending his days changing the locks on vacant homes, as many as eight a day. Eventually, he says, he changed the locks on two-thirds of the homes in his own neighborhood. The first step was to check whether anyone was there. He would peer in the windows, put his ear to the door. A beeping smoke detector was a dead giveaway — the batteries had gone dead, but no one was around to change them. If the house was vacant, he would pick the lock on the front door and go in. Foreclosures came in all conditions. Some were impeccably cleaned; some were trashed. Most were in between, with leftover clothes or furniture here and there, cotton swabs on the floor or beer bottles on the table. In one house, he remembers, right by the front door was an end table with Halloween candy in it. It was August. "It just looked like they vanished," he says. The house was completely furnished. There were pictures on the walls, bills on the counter. "The most unsettling thing was the clothes still being in the dressers, in the closets. They were just gone." Decker is a homeowner himself. He and his wife bought their house in 2006. At the time, they thought they were getting a deal. They bought from a friend who needed to sell in a hurry and ended up buying the house for about $30,000 less than its appraised value. In reality, there could not have been a worse time to buy a house in Phoenix. As they bought the house, prices began stalling; soon after, they began to crater. The Deckers were underwater by 2007. At the bottom of the trough, their home was worth half of what they had bought it for. He and his wife chose to stay. He says their mortgage was a contract they had made with society, that it would be irresponsible, even immoral, to walk away. But every time his job took him into a foreclosed home, he was faced with his own decision to stay. "I felt like a sucker. Like, here I am, paying my bills, and everyone else — I don't know," he says. "Are they in a situation where they lost their jobs and they just had no choice? Or are they like some people that I know who just decided, 'Well, this is a bad situation. I don't want to be underwater for 10 years; I'm just going to walk'?" Decker and his wife are still living in the same house. They hope to be above water next year.